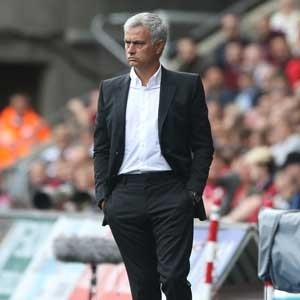 Stoke-on-Trent - Jose Mourinho admitted Manchester United were well below their best as the Premier League leaders were forced to settle for a 2-2 draw at Stoke on Saturday. Mourinho's side lost their 100 percent record with a sloppy display that saw United fail to hold the lead given to them by goals from Marcus Rashford and Romelu Lukaku. After trailing to Eric Maxim Choupo-Moting's first half goal, United were on course for their fourth successive league win until the Cameroon forward punished a slip from Phil Jones to head his second of the game. Mourinho acknowledged United had lacked rhythm after the international break, but he was still frustrated to see his team lose their unblemished record as they conceded for the first time this term. "It was a difficult match for different reasons. My players, after the international break, are not the same," Mourinho said. "I'm not satisfied with a point because we were the team closer to winning. "One team tried to win, one team tried to get the point but they fought hard to get that point. "They defended well, they counter-attacked and in set-pieces they are powerful."